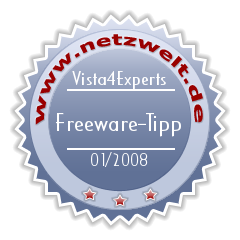 Warning: the name of the program means that this utility configures Vista for people who know what they’re doing (e.g. lowering Vista’s defenses). The utility itself is very easy to use and can be used by everyone. The “for experts” means how the system will be configured (not that all experts want to disable the UAC); it doesn’t mean that only an expert is able to use this little tool. Experts are, of course, able to tweak their systems without this tool, it’s only a time question. I had to write this clarification due to people’s misunderstandig of the name. This is a free software and so it is given without warranties, this means the use of this tool is at your own risk. I take no responsibility for any damage that may unintentionally be caused through its use. I realize, of course, that many fixes in Vista4Experts lower Windows Vista’s default security, but that’s the difference between users who feel enough confident to decide what’s best for their system and users who don’t. 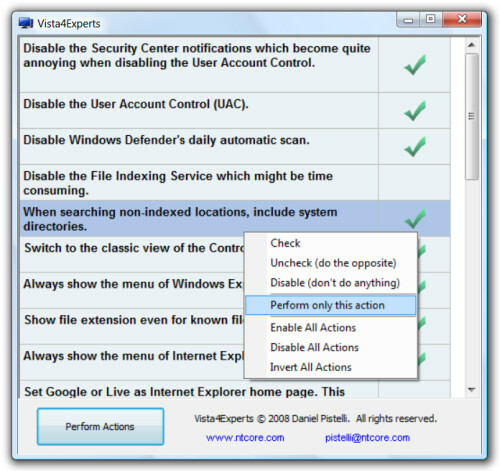 Many of Windows Vista’s security features are extremely annoying to many developers and other IT experts.